Exploring how the Photography Industry works. Making money as a photographer is going to take new ways of thinking. This is a very interesting idea for the future of photography, more photographers (photography enthusiasts) than professionals, will change with the internet disrupt the dynamic of the photographic industry. This fact alone and the ideas expressed in the two mentioned articles will alter how photographers may do business in the future. Dan Hellers post originally published on Tuesday, February 13, 2007 The future of photo sharing sites and agencies and this article published on as The Five Truisms of the Photography Buisness. These two articles should be compulsory reading for all photographers whether they are pro’s or semi amateurs who want to work as pro photographers. 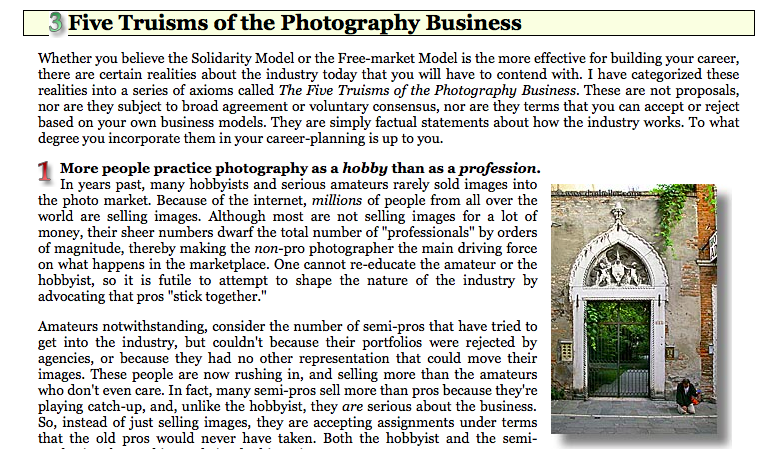 1) More people practice photography as a hobby than as a profession. This is impacting how many people can be providing images to an expanding marketplace. 2) Prices are Based on Market Factors, not Clients’ Pockets. More images are avaliable causing market factors to change how prices now work for photographers. 3) It is not Anyone’s Responsibility to do Right by You. We as photographers have to be careful for our rights but these will most likely have to change as the issue raised in point one is damaging our abilities to extract money from our potential clients. In addition to doing my photography, I am also teaching photography, it means that I am no longer worrying about my income from photography. This has freed me to rethink my own approach to photography and the subjects that I am interested in. Allowing me to start working on new work that explores areas of our society, that is not going to be so easy to make money from as a photographer. I am following this advice here and have been for sometime, without knowing it. 5) Not all Photographers are Equal. “Many new photographers come into the scene by working for less (or for free) to get their foot in the door, sometimes displacing the previous shooter who used to do that job. I’ve displaced other photographers this way, and others have done it to me. Those that I’ve replaced should have moved on with their careers before I got there; and those who’ve replaced me usually did so with my blessing: It was time for me to move on. (Many times, I just recommend someone to take my place even though the client doesn’t want me to leave.) If your career develops properly, you won’t get displaced. Your name, reputation, portfolio and general experience will be justification enough for you to choose which jobs you want, and when you want them.” Dan Heller. Thinking this way will change your approach to generating clients and how hard you seek to hang onto existing clients. I was talking with my wife a few nights ago about a photographer we both know, about his main client that he has had for at least 10 years, which is a really long time for a photographer. If I was him, at this point I would be worried, as I would be seeking to build redundancy into my working profile for when they find others to work with. We have had a rapid reduction in the cost of becoming a photographer, learning the skills and practices of professional photographers has got easier with the barriers to entry as a photographer greatly reduced. At the same time, the internet has altered how clients work and their traditional markets. This photographers are aware of, but not thinking about, the way that more photographers have also affected existing professionals. Photographers ability to make money has also been exacerbated and hidden in plain site by the changes that our media clients have also been experiencing which is also been cause by the profound changes that the internet has enabled, so I think we have confused these issues when we think about the current state of the photography industry.